Whether you plan on riding our system once, or intend to commute regularly, we will help you quickly and courteously. Pick up one of our brochures, which include QR codes designed for residents and visitors to access the Selkirk Transit website and Nextbus. The real-time arrival website passengers can access with smart phones. Selkirk Transit is truly a community service in every sense of the word. Looking forward to our future, our growth…your service! 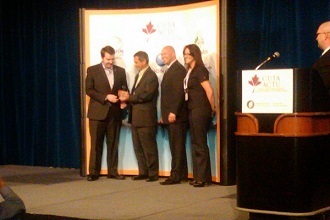 In 2012, Selkirk Transit received the CUTA Corporate Leadership Award for Innovation. 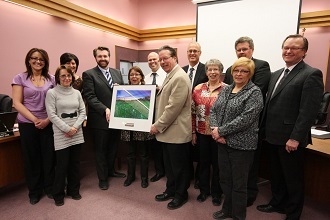 In 2013, Selkirk Transit was the recipient of the Municipal Excellence Award. These honors demonstrate that Selkirk Transit continues to be committed to ensure sustainable development, encourage community development and sustainability. While also reducing the City of Selkirk’s carbon footprint and providing exceptional customer service. Transit is both recognized as both an economic development tool and social equity investment. In focusing on community awareness, Selkirk Transit has partnered with the Tourism Development Committee of the Selkirk & District Chamber of Commerce. In order to develop a program to educate new residents and visitors on the transit system and our community. While utilizing the transit service ask for one of our brochures for the hop on, hop off community tour. This initiative is a significant cost savings program that reaches a significant audience. The program increases community awareness of Selkirk’s historic buildings. While also noting the passing of pioneer entrepreneurs, visionaries and families who contributed to the character of this fine community.